In Christ, we step out into a culture that swirling in rhythms of anger and violence and frustration and anxiety. We step out as salt, as blessing, as the gift the sustains and even heightens the joy of each moment. We step out as light, the light that shines out in the darkness. During this Epiphany season as we meditate upon the revealing of Jesus Christ to the world, we cannot help but hear the clash of anger and dissent echoing through our culture on the left and the right. After a contentious election season, the contention has only increased to the point of shrill and even violence. Eugen Rosenstock-Huessy once said that you cannot have peace without creating rhythms of peace. For far too long our culture has been feasting on violent words, violent entertainment, and violent thoughts. Even our cries for peace have often been voiced in violent ways by violent people at war in other ways. We also live in a time when every word and every act is reduced to the political. To the fight for power. There is a hesitancy to say anything when anything you say could be taken as an invitation to argue. Everyone must be on their guard, and must be ready to defend their position at any given point. This climate leaves little room for the weak and trembling. A couple years ago, I heard a gentleman from the tech world talking about his new book on Terry Gross. He spoke of a world where super performers would become something of international citizens while everyone else would fall behind. In the terrifying world he envisioned, only the successful and strong would thrive. Any mistakes could cost a person, could resign them to a secondary position. He described a world without mercy. A world without mercy has little room for the weak and trembling, for the motherless, for the refugee, for the struggling, for the fearful. As I have been reflecting upon our Scriptures for this season and upon our call to follow Christ in the way of the kingdom, I am feeling the anguish of this moment. I want the outsider to be welcome. I want to the 65 million displaced peoples in this world to be safe and loved and protected. Justice without the cross can easily become another form of oppression. Thomas Merton once warned that a humanism that is not Christian will kills humans in order to protect humanity. So we return again to the Gospel and the lessons of Scripture for wisdom on the way of God in the midst of a world gone wrong. Let’s begin by reflecting on Paul’s letter to the Corinthians and we’ll end with Jesus’ call be the salt and light in this world. At the time that Paul writes his letter, Corinth is becoming one of the great cities of the Roman world. It was a time of growth and expansion. The city was thriving trade center, a growing manufacturing center, and even a popular tourist destination. All sorts of people groups were coming and going. The church appears to have been made of up various racial groups. Some of them were wealthy and some were poor. It included all classes and races. And I, when I came to you, brothers, did not come proclaiming to you the testimony of God with lofty speech or wisdom. 2 For I decided to know nothing among you except Jesus Christ and him crucified. 3 And I was with you in weakness and in fear and much trembling…. (1 Co 2:1–3). In weakness and in fear and in much trembling. This is fascinating because we know that Paul is a Roman citizen, that he is highly educated, and that he was quite successful as a Pharisee. But he comes in weakness and in fear and in much trembling. Paul comes to Corinth as the salt of the earth and the light of the world, and he comes in weakness and in fear and in much trembling. He knows nothing except, Jesus Christ and him crucified. This is his power and his wisdom: the cross of Jesus Christ. In a culture that valued wealth and power, Paul focuses on his weakness. His absolute dependence on the Gospel of Jesus Christ. This might help bring the contrast more fully into the light. There is a way of relying upon human strength and ingenuity and a way of trusting God’s generosity. Throughout history, these two ways are called different things. In the Garden of Eden, we could speak about a way of receiving God’s free gifts or a way of grasping and taking that which is not gift. Adam and Eve choose to take, to grasp, to turn from God’s generosity toward man’s striving. This grasping and striving shapes many of the stories of Genesis. In Israel, we might speak of the way of the Lord versus the way of idolatry. The way of the Lord is rooted in the fear of the Lord, in trusting the Lord, waiting upon the Lord. The way of idolatry is the way of trying to acquire power and provision through various techniques, alliances, and ultimately false worship. The people are warned that those who make idols will become like the idols: deaf, dumb, and lame. In other words, they will become less than human. Beastly. Blind, stumbling, fighting, striving, grasping. Paul proclaims the Gospel of Jesus Christ in Corinth, in a culture of grasping and striving for power. He comes in weakness and in fear and in trembling, trusting only in God’s provision and power. And the Lord works through Paul create a community, a called-out people, a church. A family who finds out in God’s love and provision. But now this same family, the community of believers in Corinth is falling back into the patterns of Corinth. They are striving with one another. Competing for who is great, wiser, more powerful, more gifted. In first and second Corinthians, Paul is inviting them back to the place of weakness, of trust in God’s grace as revealed in Jesus Christ. Only from the place of the cross can they learn to become the people of love. The community shaped by faith, hope and love. At this moment in time, we find ourselves in a culture of striving and grasping. In a time when cries for justice echo from the left and the right. But both sides mean something different by justice and both sides are striving for power to bring their vision of justice to light. It is in this moment that we come in weakness and in fear and trembling before the Gospel of Jesus Christ. the generosity of God. I have nothing to give this world, save the grace of God revealed in Christ Jesus. I didn’t create myself. I cannot create the sunrise or the sunset. I am much weaker and more dependent than I realize. I cannot create the air that will sustain my next breath. Each moment, I depend on the blessing of God to breathe and to live and to move and to have my being. And there is no lack in God’s provision. He is generous. He is the ever-gifting God who surprises with His love in every moment. In a world clouded by striving and fighting, I may think there is scarcity. There is not enough goodness, not enough justice, not enough provision. Before I succumb to the violence of the moment in word or deed, I return, I turn back to the cross of Christ. I re-center. I find my hope and peace and provision in God’s graciousness. I realize afresh that I am weak and often fearful and trembling. Like Paul, I realize that “whatever gain I had, I count as loss for the sake of Christ. Indeed, I count everything as loss because of the surpassing worth of knowing Christ Jesus my Lord” (Php 3:7–8). Now something fascinating begins to happen. First, I realize I am at home alongside the weak and the marginalized of the culture. My love for them is not political action but is love rooted in God’s love, realizing they need His blessing and love just as I need His blessing and love. They are not beneath me but they are His gift to me and I am His gift to them. I may just begin to realize that I am blessed and part of the blessed community of Christ. I live out of that blessing, out of that provision in Christ. I go out into the world, into my job, into my school as salt and light. Think of salt. It heightens the flavor of foods. A little salt can magnify the delight of a meal. I am salting the world. Salt preserves and is an essential nutrient for living. There was a time when nations went to war for salt. Salt is a blessing. When Jesus calls us light, he is calling us reflections of His light that shines out and overcome all darkness. We go as in Christ, through Christ, by Christ. Christ before us. Christ behind us. Christ beneath us. Christ above us. Christ within. Christ without. We go as revealing His light, His glory, His beauty. We gather hear and rehearse and remember His life poured out for us. We partake of His body and His blood. Then we go out, as His blessing for the world around us. We go out in weakness and in fear and in trembling but as beloved who are called to love. In his grace and wisdom, we are learning how to speak to word of love to those to the right of us and to those the left of us. We are learning how to serve and speak and act for justice in a way that is rooted in Christ Jesus. By His grace and in His love, we ourselves become the rhythm of peace in a society filled with violence. We ourselves become the song of praise. We ourselves become righteousness, peace and joy in the Holy Spirit. This will mean that we often wait and watch in trust that He is faithful. We serve and seek to act in just ways, but we trust that He will unfold His justice in His way. As Augustine reminded us, we seek to build a society of friends, but we ultimately know and trust that only He can truly build the society of friends that will grow in love forever. Hauerwas, Stanley (2014-04-15). Resident Aliens: Life in the Christian Colony (Expanded 25th Anniversary Edition) (Kindle Location 565). Abingdon Press. Kindle Edition. “[M]ost modern secular humanisms are concerned with man in the abstract, with the human species… And it is, therefore, very easy to complacently love abstract humanity as the idolatrous projection of self while hating and mercilessly persecuting one’s concrete fellow man… love of an abstract good and ideal is taken to justify relentless hatred of a certain group of men in the concrete.” Merton, Thomas (1979-05-01). Love and Living (p. 148-149). Farrar, Straus and Giroux. Kindle Edition. 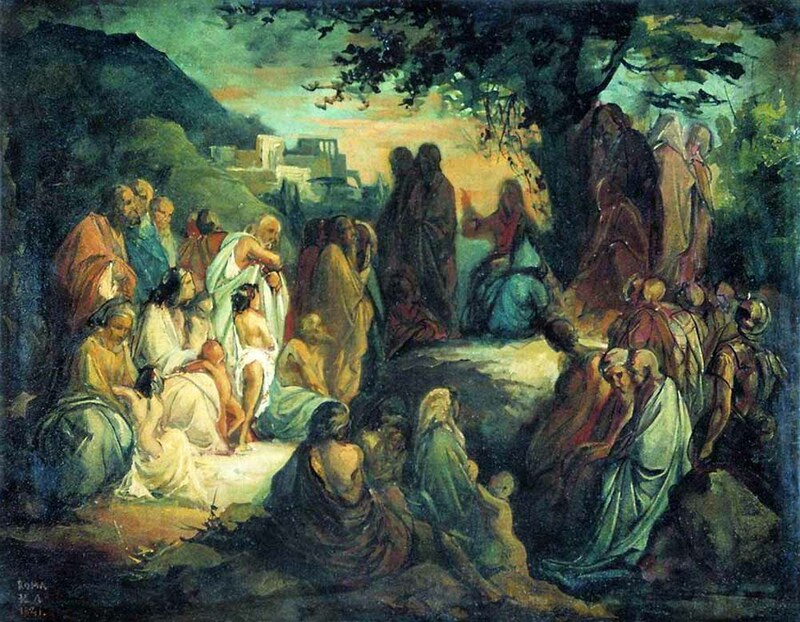 Image by Nikolay Lomtev (Sermon on the Mount – 1858).